After months of undertaking, all of the encampments in San Francisco’s Mission District have been “resolved” — in other words, moved off the sidewalks. 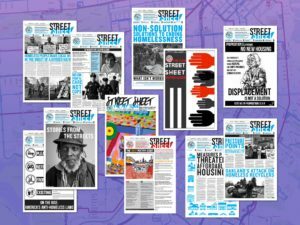 Or at least that’s what Street Sheet learned from recently acquired documents by the city’s Department of Homelessness and Supportive Housing. “Resolution” is the City’s term of art describing the relocation of people living in temporary structures, such as tents. 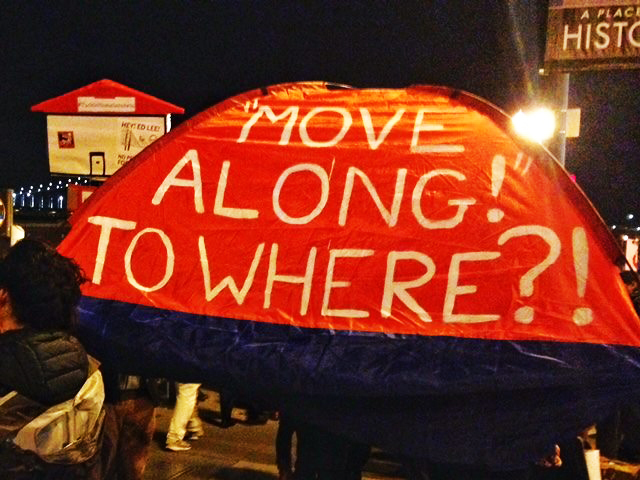 When the city resolves an encampment, they offer places for folks to go —such as a Navigation Center. This is different from a “sweep” where folks are just forced to move, usually across the street, and often have property confiscated in the process. Soon-to-be-displaced residents told “sweeps watchers” led by the Coalition on Homelessness that City workers engaged in sweeps offered no services. They also mentioned the lack of notice given; instead of advanced notice, City workers —police, in particular —ordered them to clear out immediately. While it’s not apparent where now-unsheltered campers could go, what is more evident, based on agendas from meetings of the Encampment Working Group, is that re-encampment teams include cops paying visits to ERT-resolved areas. The Homelessness Department-led working group and the re-encampment preventers share three other agencies in their ranks: Public Health, Public Works and the police. Also, the meeting notes say that the re-encampment teams report new people living on these streets. 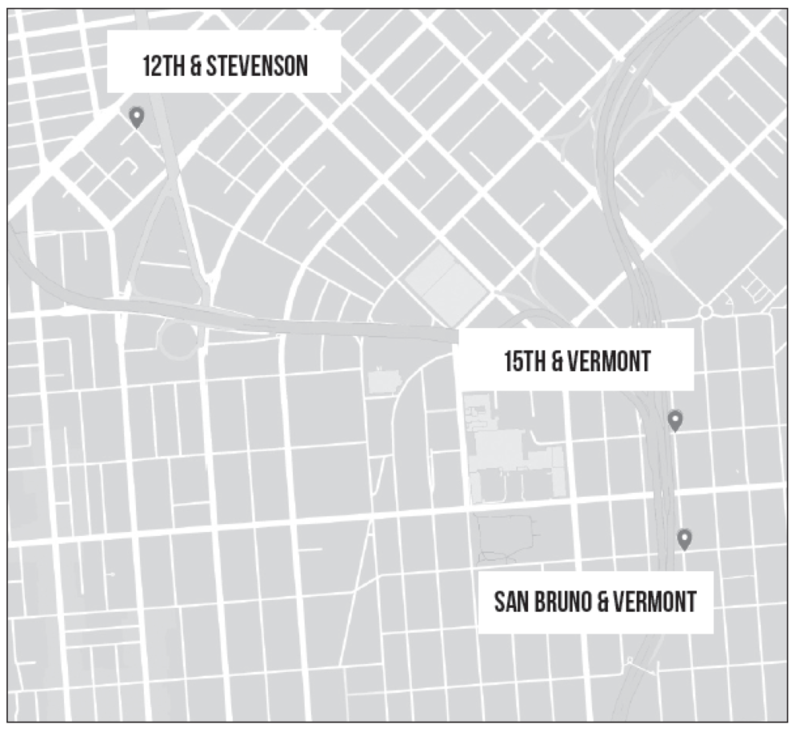 Three specific encampments that the Encampment Resolution Team have noted at Vermont between 15th and 17th streets, Stevenson and 12th streets, and 17th and Vermont and San Bruno Avenue. That team also found the San Bruno street area that includes Showplace Square to be repopulated with two- and three-person camps— not to mention at least 20 bicycles. When the Coalition on Homelessness has visited sites at risk of or undergoing resolution, the refrain from folks living in them has been receiving no warning from City workers or no services offered to them. Couper Orona, a disabled former firefighter from Sacramento who has camped outside on San Francisco streets for two and a half years, joins that chorus. She has firsthand experience with the ordered decampings. She receives “move along” orders at least twice a day from civilians and several times a week by police. In the last six months, the cops told Orona to vacate five times, more often than not without previous official notice. In those situations, she reminded police that posting notices is part of proper procedure. Also, she wasn’t offered to relocate to a Navigation Center, or any other services. At her most recent relocation, she said that police were gruff with her and exuded “a tough guy attitude.” It was on Division, near Brannan and Potrero. She moved to the other side of the street for three weeks. Fortunately, that gave her encampment neighbors enough time to get into a Navigation Center. Orona is not alone in criticizing police involvement in the resolutions. In a recent interview with the San Francisco Public Press, an unnamed former outreach worker recently said that the cops’ presence undermines trust built with camp residents. “We may be seen with (police), but we don’t want to work with them,” the former outreacher said. When police and Public Works descended upon a camp outside a Best Buy on Division in the last week of September, Orona sent a text: “They finally made me lose it.” The message went to Supervisors Jane Kim and Hillary Ronen, as well as the Coalition on Homelessness. Kim and Ronen, who represent the areas with the encampments, came to the area, she said.